We’ll review our findings with you, carefully and thoroughly, allowing time to answer all your questions. 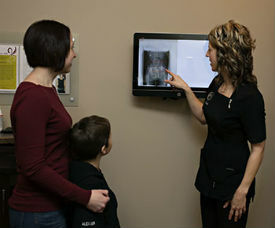 Your second visit at Grand Falls Chiropractic Wellness Centre is your doctor’s report. It is your most important visit. You will be given recommendations for essential vitamins and daily exercises that will also, in conjunction with your adjustments, contribute to your overall healing and well being. You will receive your first adjustment at the end of this visit. Plan approximately 30-40 minutes for this visit. Contact us today to schedule your appointment. We’re here to help!